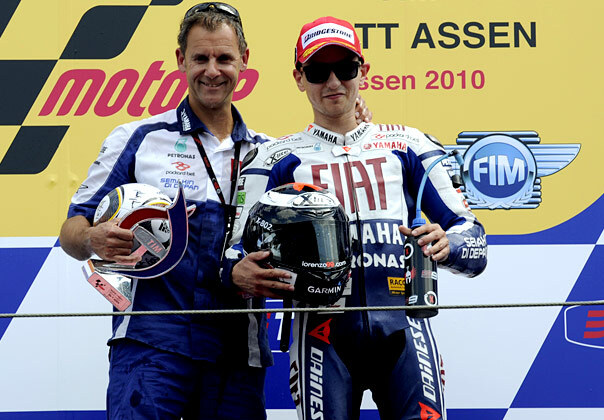 Zeelenberg Interview - race | Yamaha Motor Co., Ltd.
FIAT YAMAHA TEAM Manager Wilco Zeelenberg reviews the 2010 season. It gives me great pleasure to talk to all the Yamaha fans around the world on the back of such a successful first season with the factory in MotoGP for me. As you all know this was my first season in this championship and as a professional it was easily the best year of my career, having been in racing now for forty years (from the age of 4 to 44!). It is difficult to know where to start talking about the season but I suppose you are interested to know how it was from my point of view, and the role I was able to play in the team, so that is what I will try to do. At the start of the campaign I could not have imagined that we would end up as World Champions and it is a wonderful feeling. I am lucky to have been in a title-winning team before, with Cal Crutchlow in World Supersport last year, whilst Javier Ullate was a mechanic for Alex Criville when he won the 500cc World Championship back in 1999, but for the rest of the crew – even the experienced Ramon Forcada – this was their first one and you can feel it is very special. Of course with nine wins out of eighteen races without a single race crash is unbelievable. The first half of the season was brilliant, with a lot of victories, but the period after the summer break was not so easy. We went to Brno and suddenly the Honda had improved a lot. Jorge was able to win that race but with such a big points advantage it was natural for us to change our approach slightly. It was a difficult situation to manage. Jorge is a winner but he wanted the championship so badly and we talked deeply about how we could achieve it. Winning races is important and probably the only thing Jorge has ever focused on in his whole life but now he saw that in MotoGP it isn't everything. I remember last winter I said to Jorge: "If you are on the podium at every race that will be enough, you will be World Champion." The previous points record in MotoGP was set by Valentino with 373 and he didn't set that record by winning 18 races. Obviously you can't win the title if you don't win races but if, for example, you set six wins as your target for the season you are making life difficult for yourself because you are putting yourself under unnecessary pressure at every round. In 2009 Valentino won six races and Jorge won four but the difference between them at the end of the year was not the races they won but the races they didn't finish. Jorge realised that and after his injuries in preseason he was happy to finish second in Qatar in the first race, which was a big step for us. In my opinion Valentino and Casey were racing each other from the first test. They were not testing they were qualifying! At Sepang they were breaking lap records whilst Jorge still had to wake up, but my feeling was that they had started pushing too early. 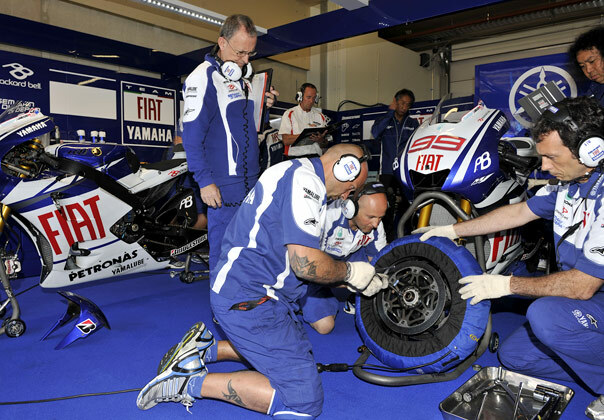 I told Jorge not to worry and to focus on his job, which was to prepare his bike and himself for the season. It takes a lot of effort and in my mind only Ben, Jorge, Bautista and Casey have been able to maintain good speed to the end of each race in the final stages of the season. For this you need fitness and motivation – you also have to be lucky, for sure, but my point is that it is important to bear in mind from the start of testing that you are only at the start of a very long year ahead. Going back to that second half of the season, for us it was difficult. At some races we didn't have the package to win and it wasn't that Jorge was making mistakes but he couldn't ride as freely as he did at the start. That is the pressure you are under when there is a championship on the line but he knew that, we discussed it and he was ready to ride for the title when he needed to. You can ride for wins when you are an eight or nine-time World Champion but when it is your first one you need a different approach. When we arrived in Malaysia he asked me how I thought he should ride. I said: "Ride for the championship, don't think about anything else. Try to go away in the first ten laps and see if the rest can follow but if they are close let them go. The championship is more important than any victory." A lot of people say to me: "What can you possibly tell Jorge? He is the best rider in the world!" It is true that as a rider I never reached his level but there are things I see out on the track. For example at Valencia last weekend there was a place on the track where he was using third gear, which he didn't last year. I pointed it out to him and he started using second, we adjusted the bike to that and he was more comfortable. We watched the practice together on the television and saw that Casey was using first gear out of the final corner where we were using second. I said to Jorge: "If you want to have a chance of beating him you have to use first." So in the warm-up we changed the gearing, made first gear 10km/h longer, and crossed our fingers for the start! Thankfully it went well and even though he lost positions because Dani got in the way the change helped him for the rest of the race. He is quite stubborn and it often takes a while to convince him of certain things but he is very smart too and very adaptable to changes. Another thing I have done is try to look at the things that went wrong last year, put them right and tell him not to worry because those things won't happen again. I think that has helped him approach certain races in a positive and relaxed frame of mind. Jorge is a hothead and you don't need to put the fire under him before a race – if anything you have to dampen that fire a little. We don't try to change him because he is a special kid, but we want him to be calm. He said himself the other day that he has learnt a lot and changed a lot because in the past certain things about him were not good. He is different and sometimes still there are things he should not say but he can't help but be honest. The important thing is making the right changes! The challenge for us is to improve again next year and we already started working on it three races ago. I am looking to change his approach to some races, understand more about the bike on the technical side and getting the team to react more quickly to the problems that arise. We don't have much time to test over the winter so we began working on these things as soon as the title was decided. For example, Jorge has to understand that the way he rides the bike is not always the best way. As I said, we don't want to change him but we need to prepare him better for certain situations. Jorge likes corner speed but in some corners that is not the most important thing. It is not always the lap time that is important. Sometimes you have to be prepared to block or overtake and that might require a different approach to the corner so this is something we have been working on over the last few races. Personally, I am very excited about next year. It is going to be great to see these guys battling again and we need to be prepared. They say you should never change a winning team but this is motorcycle racing and things have to change from year to year to keep pace. We saw how some of our rivals changed things this year and instantly improved their performance. We did it ourselves and as a team it is important that we continue to evolve, the same as the machinery and the riders. Jorge won the last two rounds of the season, he beat Casey in Valencia and that says a lot. It gives us all confidence for next year but we have to work very hard. We will develop our way of working together because there is margin for improvement and I think we can only get better from now on. We have had some problems but our rivals have made mistakes and they have been unlucky this year. We have to admit that the points gap this year was not realistic and we have four guys equally capable of winning in my eyes. A mistake is costly because if the package is right for any of those four they can win. If they have something special for a track they can win. Our final act of 2010 was the Valencia test. We've finished early as we tested everything we needed to and Jorge felt good about all the results. It's been a long season and after the emotions of the last Grand Prix races it's time to let him go and have a rest! His feedback was that the new bike has the same feeling as the 2010 machine but with improvements, allowing us to be faster and perform better in a number of areas. Our approach for 2011 is exactly the same as it was in 2010 – to try and be on the podium as much as we can and take the wins when they are possible. I think it will be a much closer season so we will have to be on the top of our game. I can't wait! Thanks for your support.